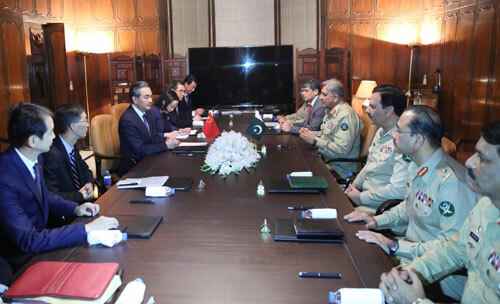 On September 8, 2018 local time, State Councilor and Foreign Minister Wang Yi met with Chief of Army Staff Qamar Javed Bajwa of Pakistan in Islamabad. Wang Yi expressed that on the occasion of the establishment of the new Pakistani government, the main purpose of my visit this time is for a comprehensive contact with the new Pakistani government, so as to elevate China-Pakistan all-weather strategic cooperative partnership to new highs and build a closer China-Pakistan community of shared future. The Pakistani military is a staunch guardian of China-Pakistan friendship. China-Pakistan military relations are an important part of China-Pakistan all-weather strategic cooperative partnership and also a symbol of the high-level political mutual trust between the two countries. It is expected that the Pakistani military will make greater contributions to promoting the development of China-Pakistan relations. The China-Pakistan Economic Corridor (CPEC) touches upon the long-term development interests of Pakistan, and the Pakistani military has made unremitting efforts in the aspect of the security of the CPEC. It is believed that the Pakistani military will continue to promote and improve the security work and secure the CPEC construction and China-Pakistan cooperation. Wang Yi pointed out that Pakistan-Afghanistan relations have showed a positive momentum of improvement at present. It is hoped that the two sides will continue to carry out dialogue and build mutual trust. Since last year, the Chinese side has undertaken mediating efforts to promote the improvement of Afghanistan-Pakistan relations and facilitate the Afghan reconciliation process. We are willing to well utilize the China-Afghanistan-Pakistan Foreign Ministers' Dialogue mechanism to continuously play a constructive role in improving Pakistan-Afghanistan relations. Qamar Javed Bajwa noted that the new Pakistani government is devoted to elevating Pakistan-China all-weather strategic cooperative partnership to new highs. The Pakistani military fully supports the development of Pakistan-China friendly relations and will continue to take effective measures to ensure the smooth advancement of the CPEC construction. The Pakistani side is committed to the anti-terrorism efforts and will continue to firmly fight against the East Turkistan Islamic Movement. Appreciating the Chinese side's efforts on mediation for the improvement of Pakistan-Afghanistan relations, the Pakistani side is committed to improving Pakistan-Afghanistan relations, and stands ready to continue making efforts to the reconciliation process in Afghanistan.